I went through a period in college where all I watched were Kung Fu movies. A lot of cheap DVDs at the beginning of the DVD explosion out of HK meant I could catch up on a lot of years of HK film very quickly. Game has been hard as hell on us too. I have yet to win a single round of it. Not sure how I managed to get Dakka work blocked. I think due to it being "games" related, and the firewall now blocks anything game related. Also hotmail and gmail, which is quite annoying. Well Go Entertainment for the win! Yeah- firewalls are weird. It's amazing sometimes what gets blocked and scary-amazing what gets through! What the hell is wrong with me? What am I doing? 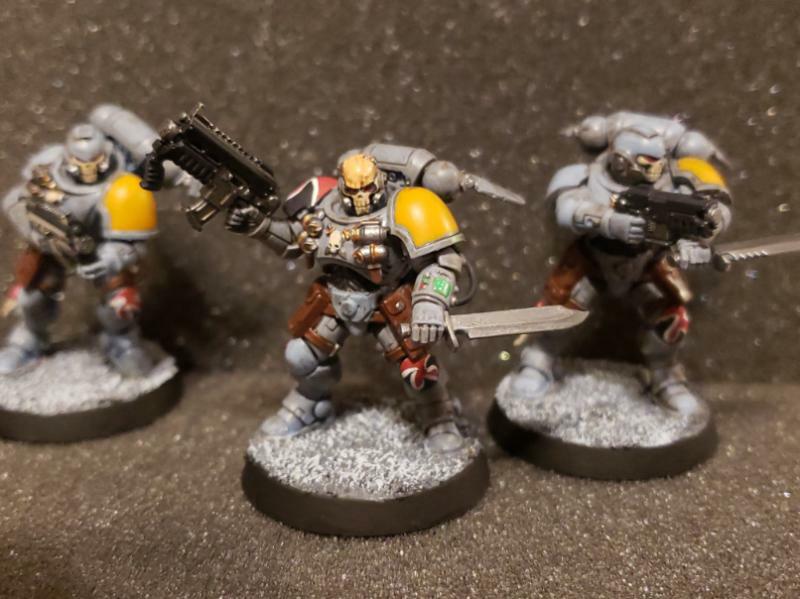 OMG did I just paint Space Wolves? Why? What happened? I had the KT box taking up too much space in the closet, so it only seemed appropriate to actually paint them. The shipping containers? We'll see. I was going to attempt to paint up a Dark Imperium set of Primaris for a gift for my cousin, so I gotta clear up as much space as possible and get in the practice of painting marines again. I particularly like his armor. I think it turned out nice too. I went back and touched up a lot of the turquoise after this photo as well. He's a bit more human sized so he'll make a good player choice the next skirmish game we get started up with. 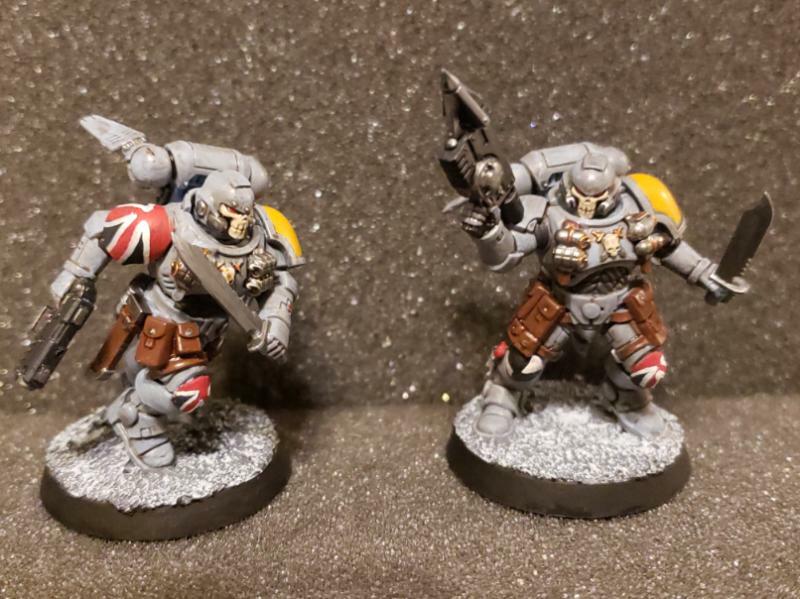 The Space Wolves look pretty good, although I'm confused by the Union Jacks on their knees. Is the one in the second picture helmetless up top or does he have a weathered skull on his head? 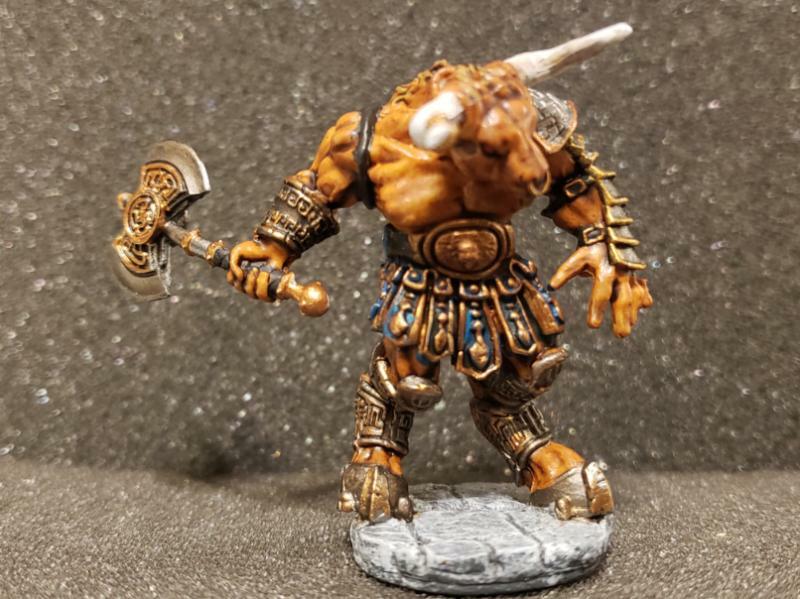 The Minotaur is my favorite mini from this batch. His armor really pops. Ha- it does look kinda like a Union Jack, doesn't it? It was supposed to be claw marks on a red background... now I can't unsee it. I like that minotaur too. 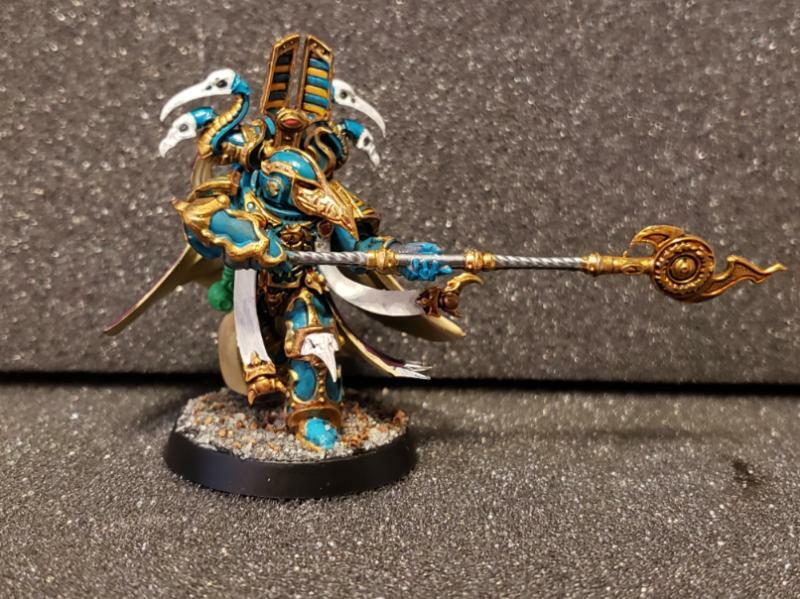 Was working on (read: getting pissed off at) some Thousand Sons Exalted Sorcerers at the same time, and the cow was just a heck of a lot easier to work on. Now to start in on my Zealot taurs and other Bones ones... I think they're all going to end up matching my Fomorian stuff from Darklands. Love that Minotaur - though I was hoping for actual cows and lupines! 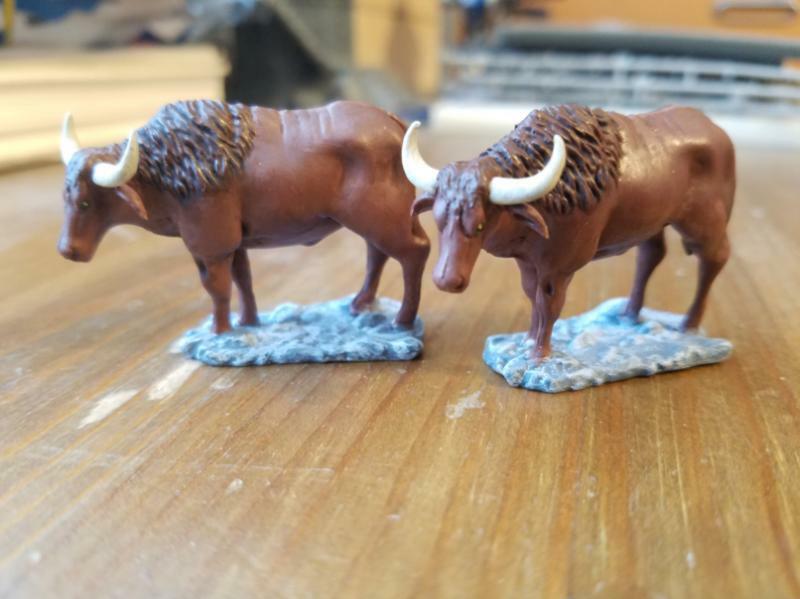 I looked at those oxen for my upcoming project, great to see them painted up. 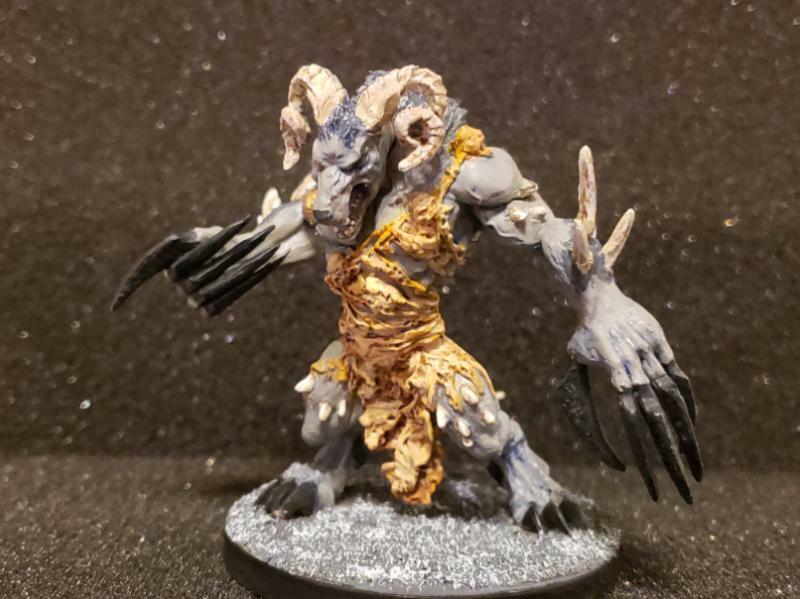 Minotaur looks awesome as well. Those oxen are quite utilitarian and have seen action in quite a few games now. I'd like some actual to scale Bones cows though. School wraps up for winter break, which means I can finally get some painting time in. I've had some of these guys sitting in front of me for well over a month. No longer! 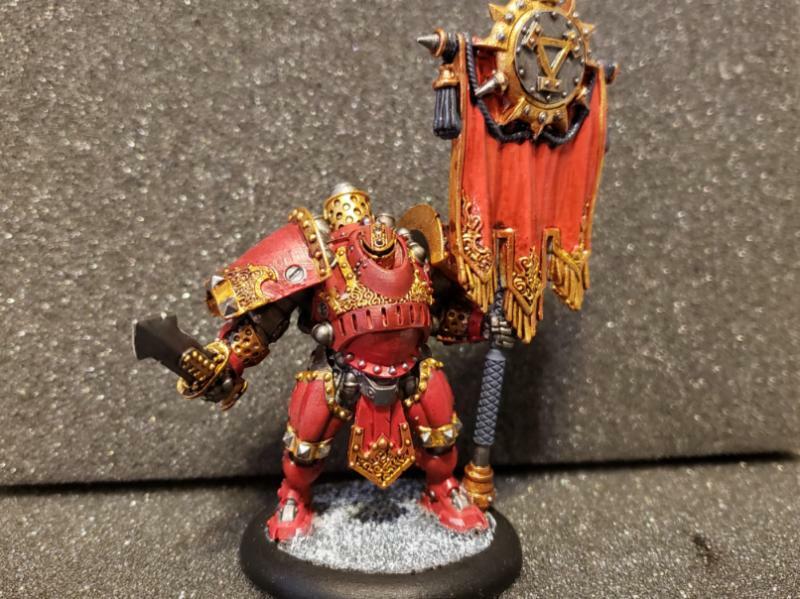 First up is this Khador Man-O-War Standard Bearer. He came with a fancy pants Kommander with a big hat and lots of filigree encrusted armor who I have not gotten to painting yet. He matches up pretty well with my other Man-O-Wars that I don't know what I'm doing with. 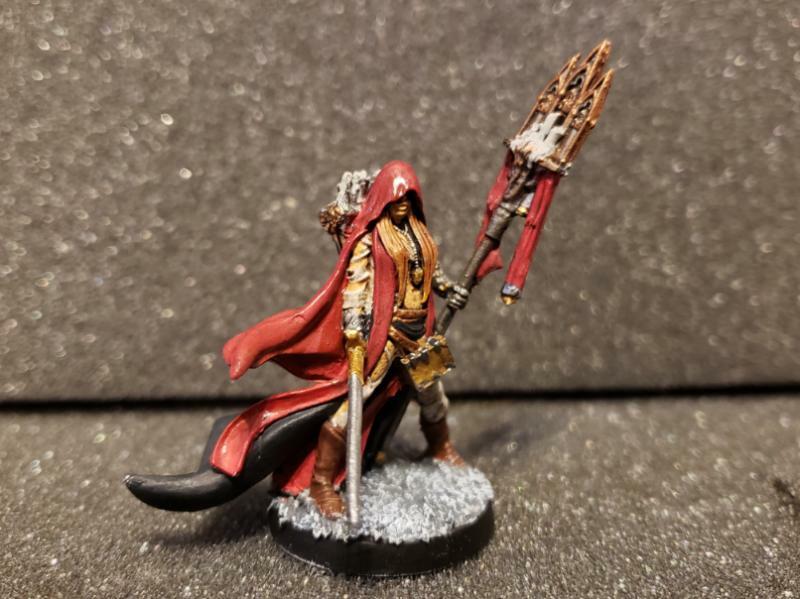 Most of my Khador warcasters and solos have been sold off. Perhaps I should grab a Man-O-War Sorscha in case I ever feel the need to play Warmahordes... or just to paint. Next up are a variety of Raging Heroes ladies, who I don't know what are actually called. I believe she's a pilgrim of some sort. I liked this sculpt. This lady looks a lot more armored than the other figures. She also broke ranks and wore blue instead of red like all the other zealots. Here's my Matron or whatever they're called. 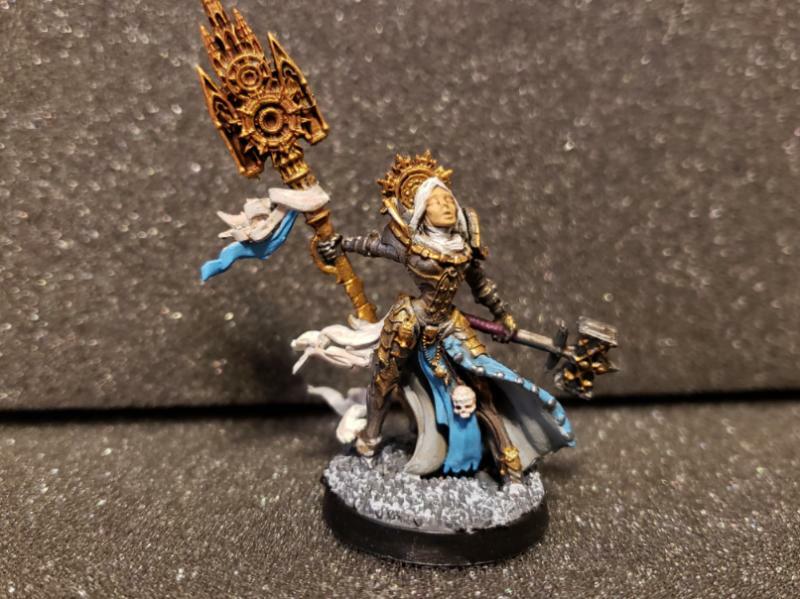 I thought of painting her up like a Custodes at first (she's just as big as one and is on a 40mm base). In the end I went with an eclectic mix of metallics. 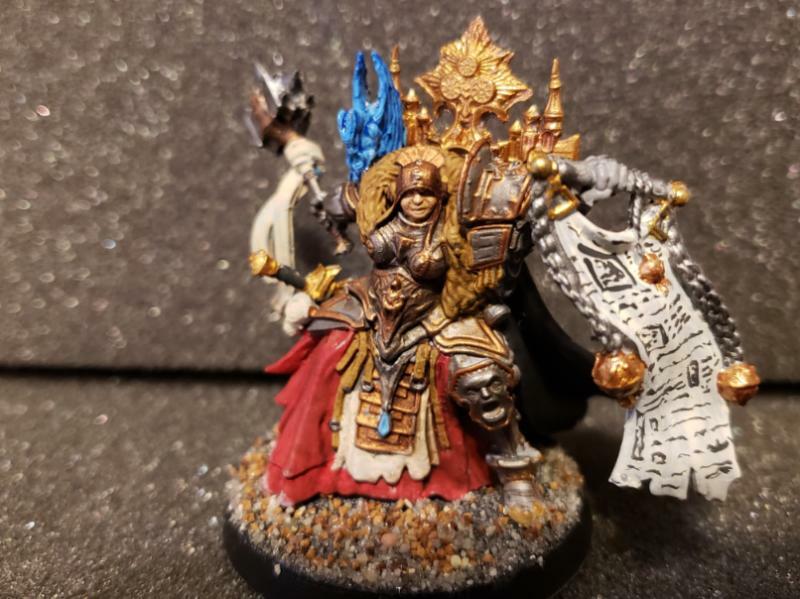 I'm happy with her war scroll. 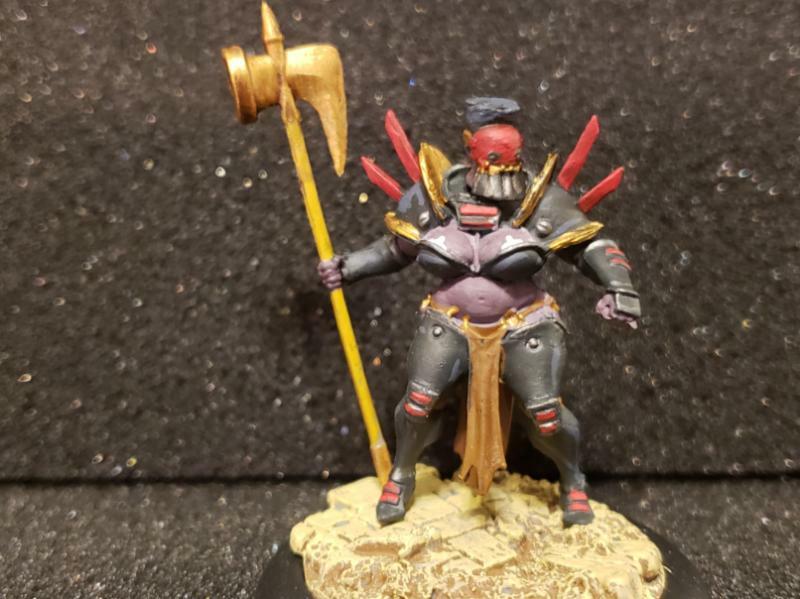 I need to do more work on the golden stuff and finish her base. 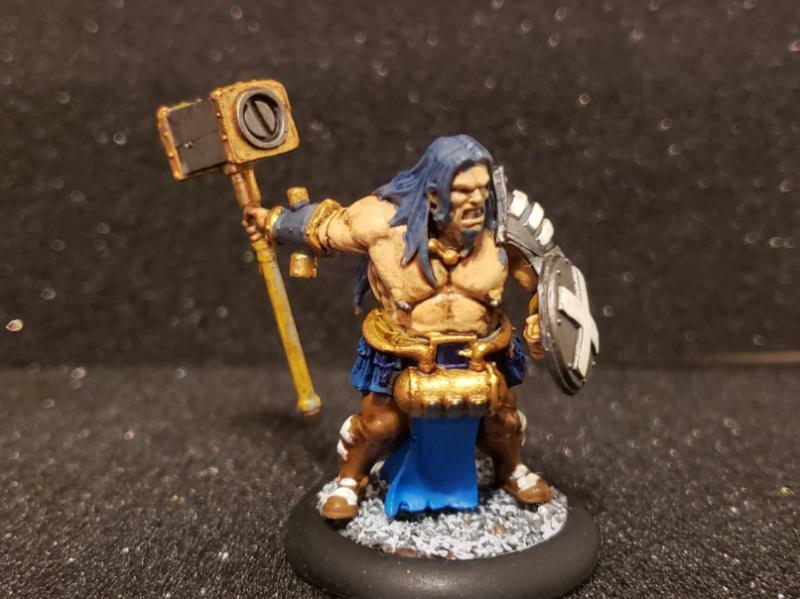 A random Hadross Pit Fighter from Wrath of Kings. 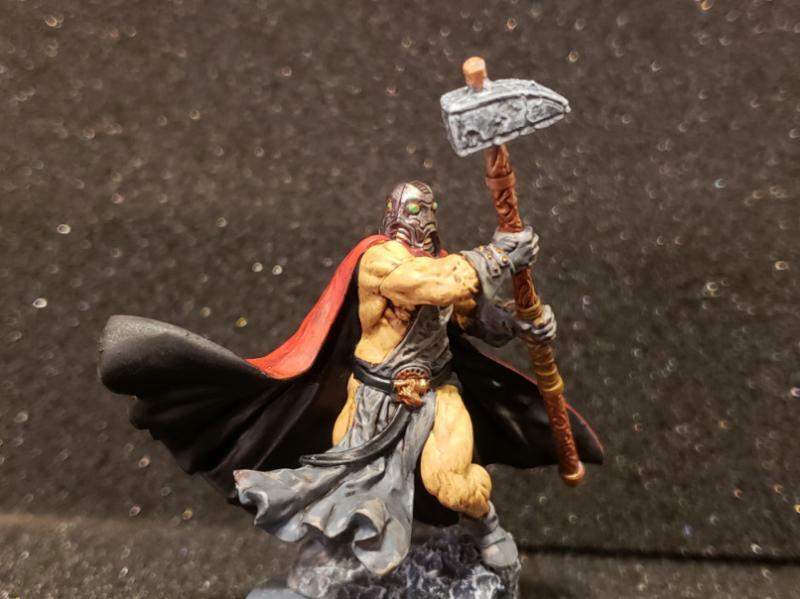 Once more this line of models from CMON makes me scratch my head. Some boxes have 10 models with 2 or 3 repeated sculpts, or 2 of the same larger kits, but nope, this box is 10 unique models. Why? What makes them so much more special than all the other factions? I dont' get the logic. I believe this guy is the unit leader. I may be wrong as I don't have access to the cards or the second book at the moment. The details on his armor were super soft, but his skin and scales were very well defined. Weird. 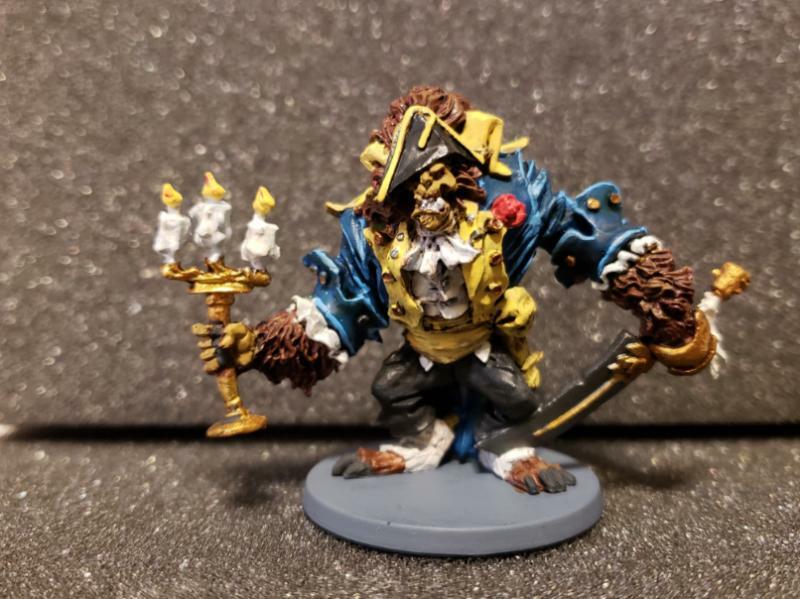 Here's the Beast from Rum & Bones, actually finishing off the box that came with Belle, the Sparda brothers, and the Bloodborne Hunter copycat. He's kinda hunched over but is actually quite large compared to the other guys, and his base is probably closer to a 40mm one in diameter. Belle's base was just as large, oddly enough. I think it's due to their role as crew members for Rum & Bones. 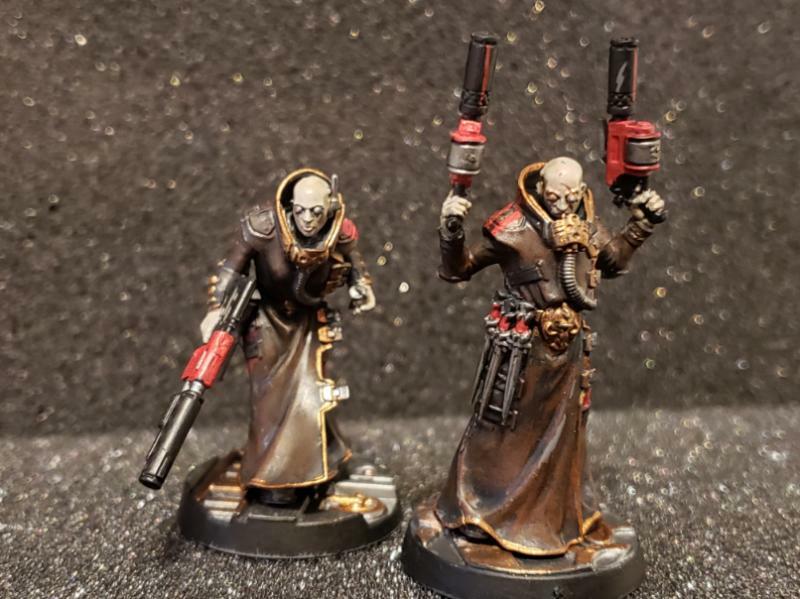 I need to fix up the trim on their cloaks, and finish their bases as well, but I'm happy their pretty much done. Probably going to do more work on all their staves as well. Subject: Highlording it up with Highlord Tamburlaine. 12/20 School's done, and so are these models! Why is the Beast cutting his foot in half? Subject: Re:Highlording it up with Highlord Tamburlaine. 12/20 School's done, and so are these models! You aren't the first person to ask that same question either! I know he's supposed to be resting his sword on the ground, but I'm guessing to keep the mold simple, the blade and his foot are totally fused together. Nice job on the Raging Heroes ladies! I was too scared of breaking mine to ever work on them. 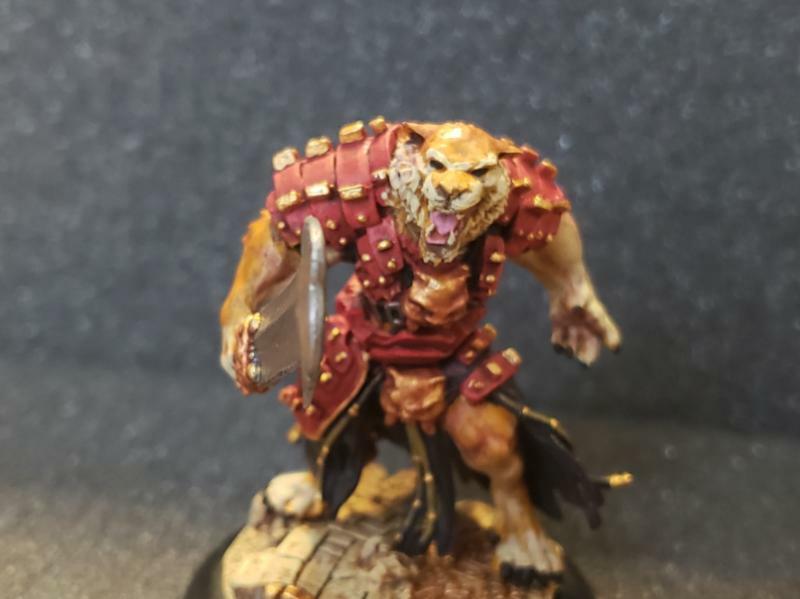 I painted a lot of stuff over the last two weeks. A LOT. So much so I already packed some of it away in the closet and most likely won't remember it for weeks or months. It might be on my youtube videos. Not even sure. 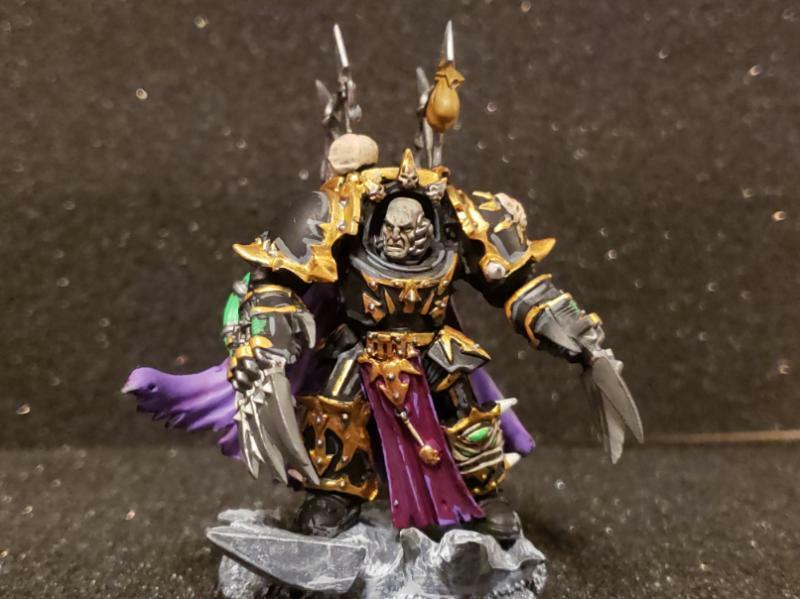 I painted the entire Dark Imperium box. I gave my cousin the marines. I painted them as Ultramarines. Then I lost the flight stands for the Inceptors. Debating how to complete them. 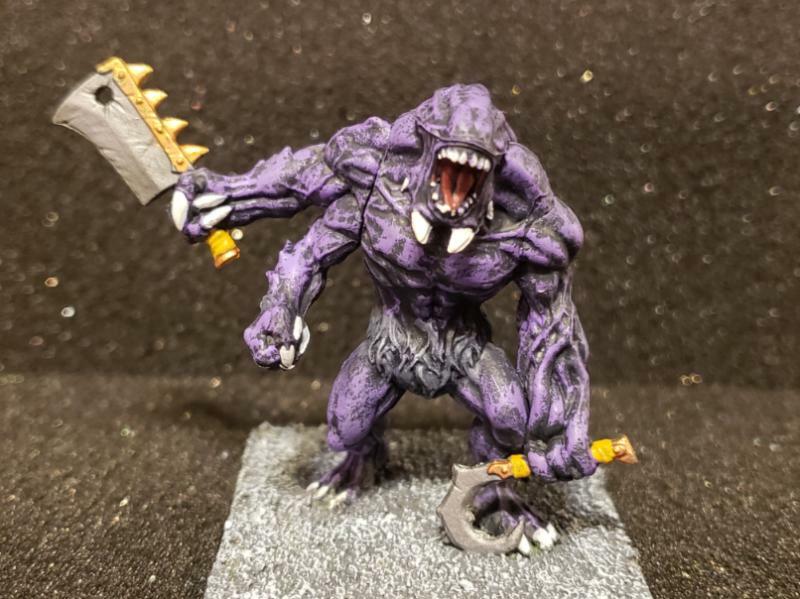 I started trying to cut down on my Mantic partially painted models. Here's some Nightmares finally done, that were started when Infestation was delivered. And a more recent model, a Nightstalker Butcher, from the Vanguard campaign. I have a few more of his friends started. I will try to finish them. Who the is he? 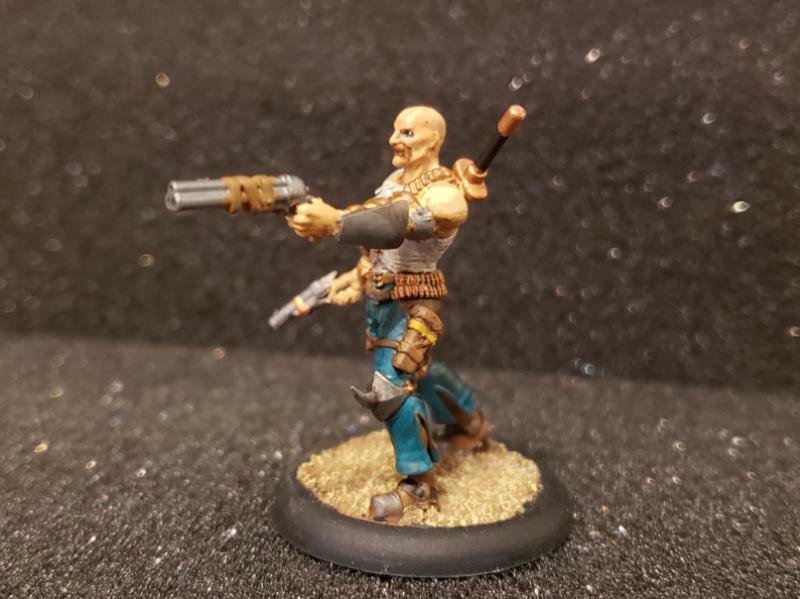 I contacted Wyrd, they sent out the guy in the art. No idea who badly is. Don't like his elongated gorilla arms. 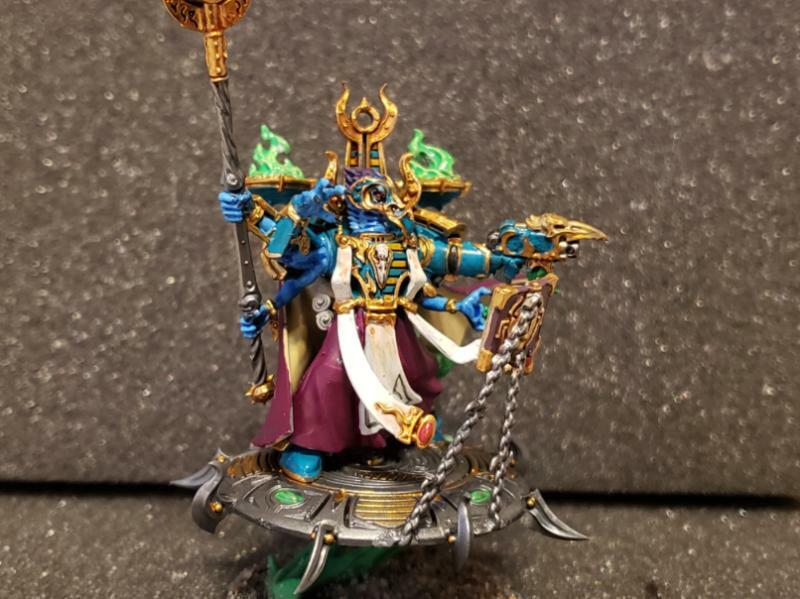 I'm really fond of this model from Legendarion. He's big too. 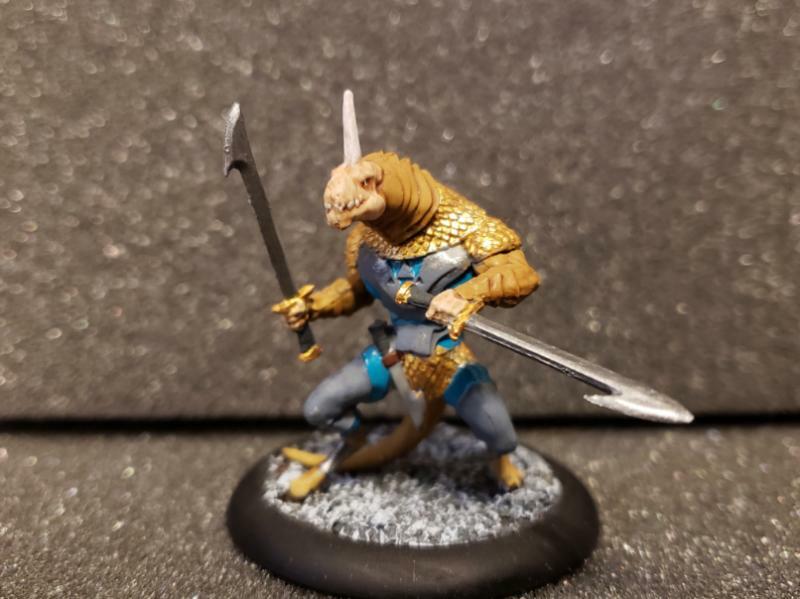 At least on a 50mm base. Maybe a 60mm. Can't remember. I hate his sword though. It's warped and paper thin. It won't bend back despite repeated attempts. I am going to dig through my SD Gundam parts and see if I can find a sword blade of comparable size to replace it with. 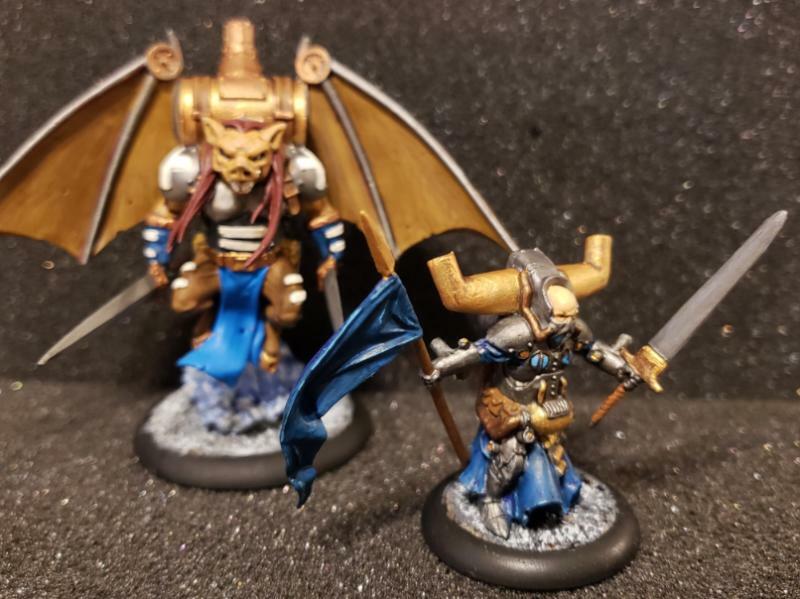 Besides all that, I painted quite a few Wrath of Kings models. I really did a lot looking at them all like this. I'll just put their photos up here. Plus a plastic Kingdom Death Forge Priest just for good measure! For 2019 my hope is to finally paint Archaon and some of the other BIG models I keep putting off! 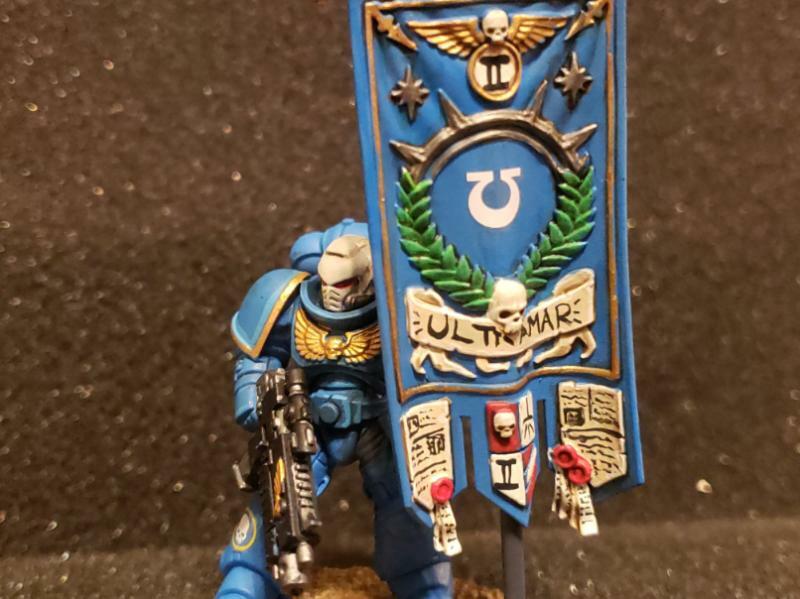 Ultramarine looks good, though a larger symbol would have been better maybe RG decided he didn’t need to overcompensate . 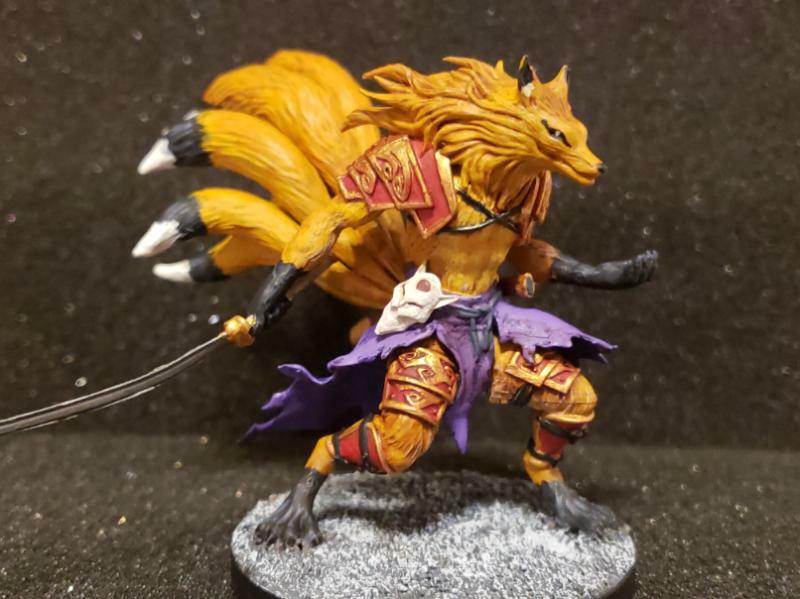 Love the kitsune, and the sheer-khan guy from WoK. Both look fantastic. That range has some real winners, too bad it’s a small dead as can be. Seriously it’s like CMoN just figures it would be too much trouble to even bother to say they are binning the game . The Wyrd stuff has grabbed my attention, but it’s a little too pricey for what I get. Though the FLGS near me has a bunch on clearance as they have dumped the whole line, just no one playing it. That's a magnificently eclectic batch of models. I'm seeing a general theme of beastmen and demi-humans in this batch. Like I said on Saturday, these are looking good. What kind of wash are you using on your humans' skin? It looks like some of them, like the Forge Priest the wash is still coming out glossy. 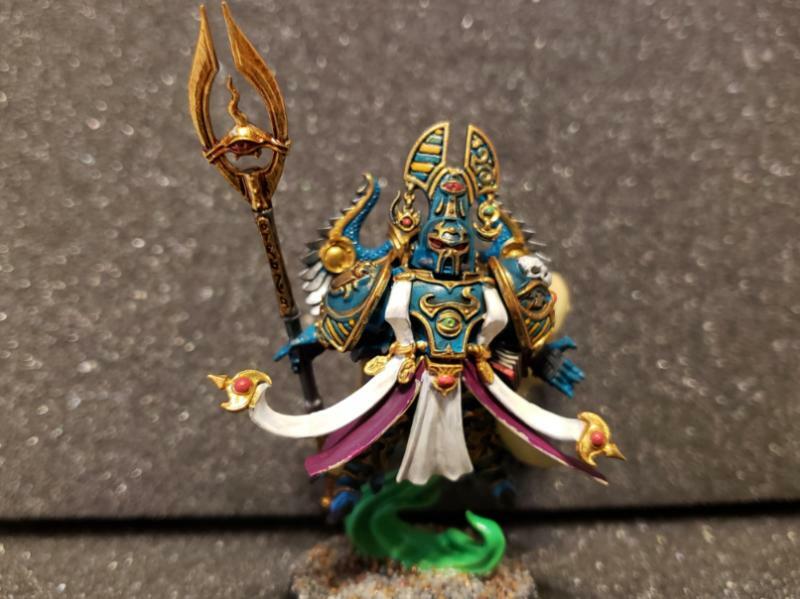 Really liking the Wyrd and Legendarion models. Hope you can get the sword worked out. There was definitely a bit of animal people taking painting priority these past few days. The rate I'm going through these Wrath of Kings guys, we ought to sit down and try playing it again. Would probably help if I painted some infantry for one of the factions rather than all the hero models. Subject: Re:Highlording it up with Highlord Tamburlaine. 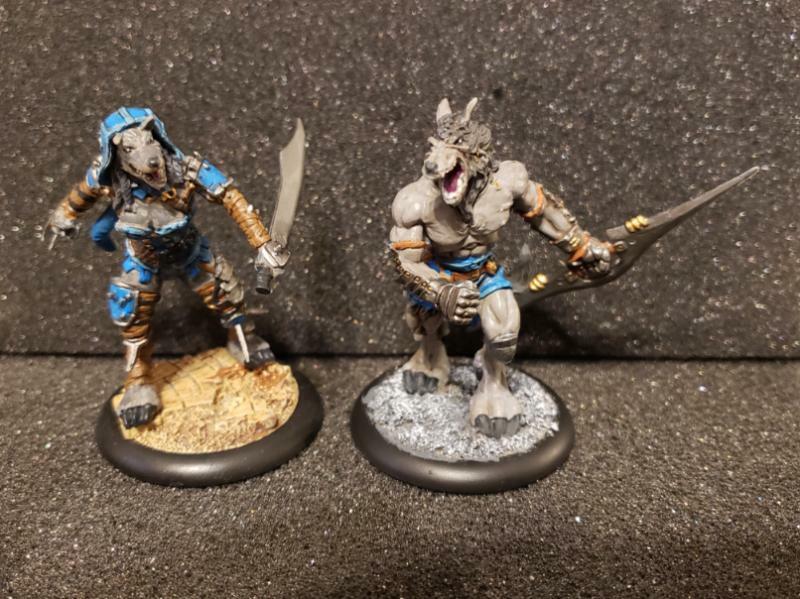 1/18 Samurai, pigs, wolves, and apocalypse! So like I said last time, samurai and fallout were up on the plate. I'm really lagging on photographing stuff. Trying to make videos for Youtube, which has been kind of interesting, is taking up way more time than I ever expected. So here's some stuff that I painted lately. There's more, but in an attempt to keep the house relatively clean, I already put a bunch of it away. I should have the rest of the Buntai started soon. Here's some of the Frontline Knights from the Brotherhood of Steel for Fallout: Wasteland Warfare. They come from the Brotherhood Starter and booster. Colors look really washed out due to my poor lighting. I'm not happy with the bases- they have what look like scan lines from a 3d printer all over them. They're serviceable at least. I'm trying to do the recruits and the two female knights as well. Both of my T60 power armors are basically done. Outside of a metallic coat I'm not really sure what to do with them though. At least their bases are nicely done. We'll see them next time I update this. Did you all ask for more Wrath of Kings? Because I can't seem to stop painting them now for some reason. 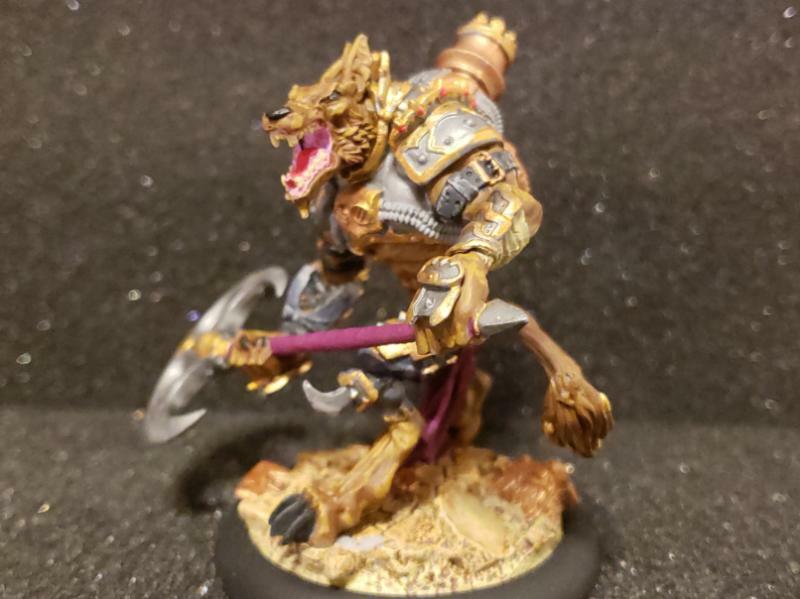 More Goritsi wolves. The female one's fur is very disappointing after I sprayed her with the matte sealer. I may need to redo it, but I can't remember what color I used originally! Another Teknes hero. I don't get those vent things on his back. There's no openings for them! More Teknes. These two pigs are on 40mm bases and are some sort of veteran unit that I can't be arsed to go look the names up to. They're in the second book, I know that. I like the caped guy. Getting started on some of my Eden figures. These guys are Resistance. I believe they're Pilots is what the box said. They look like ex prisoners. I like the mace lady. They aren't Mohan level of paint jobs but they're serviceable. Last up for the moment is a Deep Cuts figure from Wiz Kids. I know some of Dakka really seem to like these figures. They're alright. Sometimes it's hard to discern their details. He does have a helmet on under that animal skin. 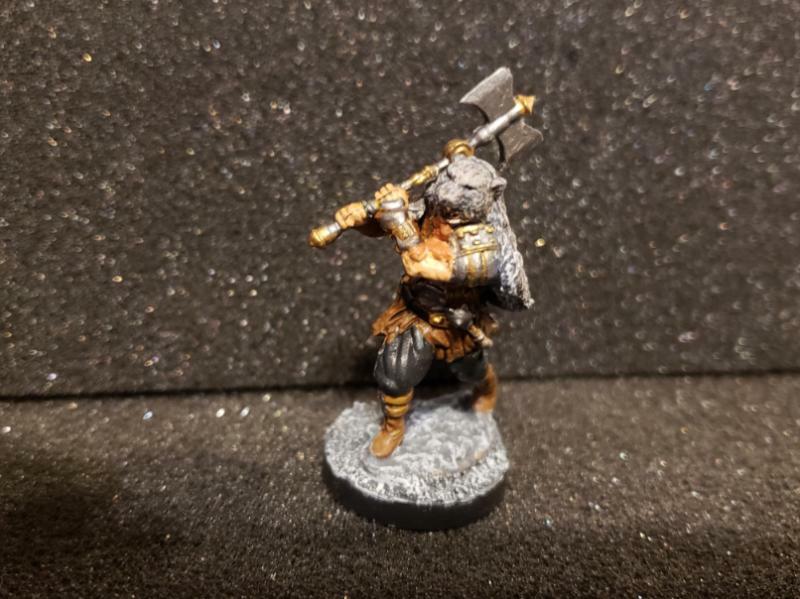 I'm not sure if he has a beard spilling over his arm or not, but that's how I painted it because that's what it looked like. It could just be a bunch of flash for all I know. One thing I don't like are those tiny discs that Wiz Kids likes to call bases. They're way too small! 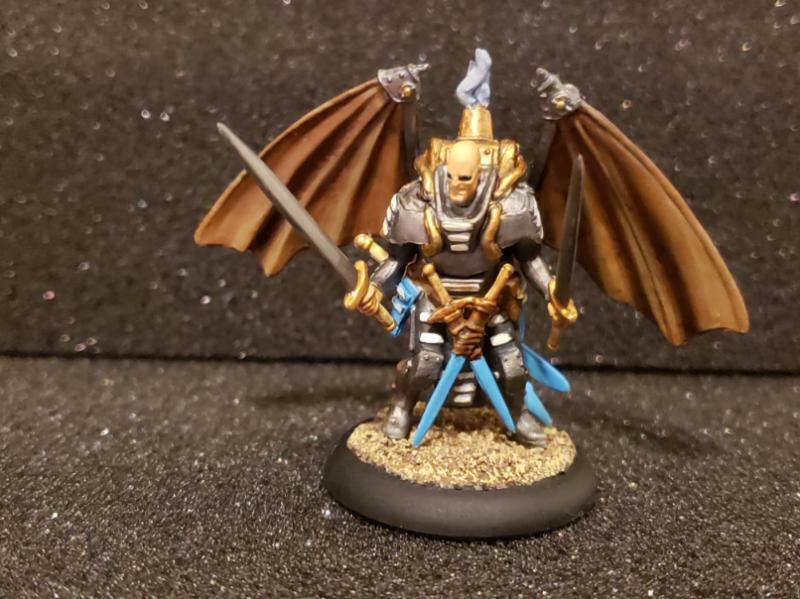 I ended up gluing this guy to one of the Reaper bases that came with one of (all of?) their Kickstarters. So that's what I've been up to. 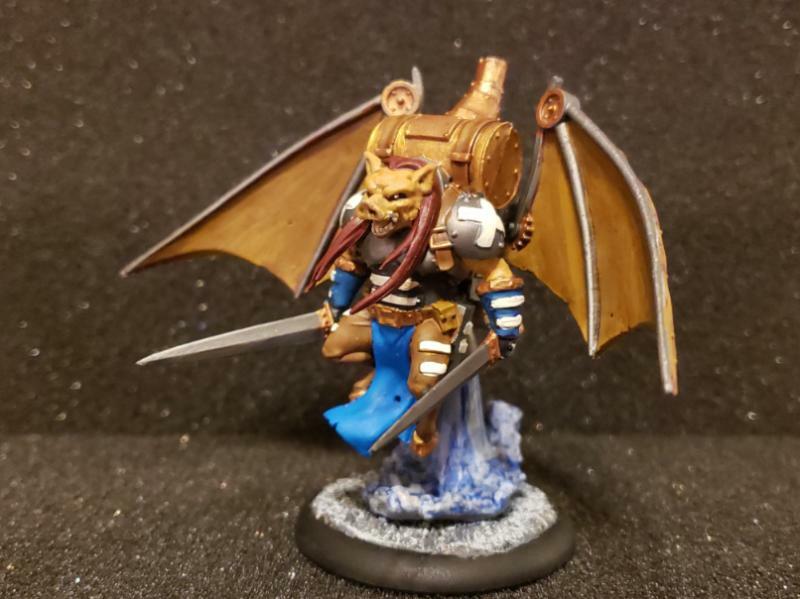 Next post should be more Fallout, samurai, wild animals, and ... Blackstone Fortress? Subject: Re:Highlording it up with Highlord Tamburlaine. 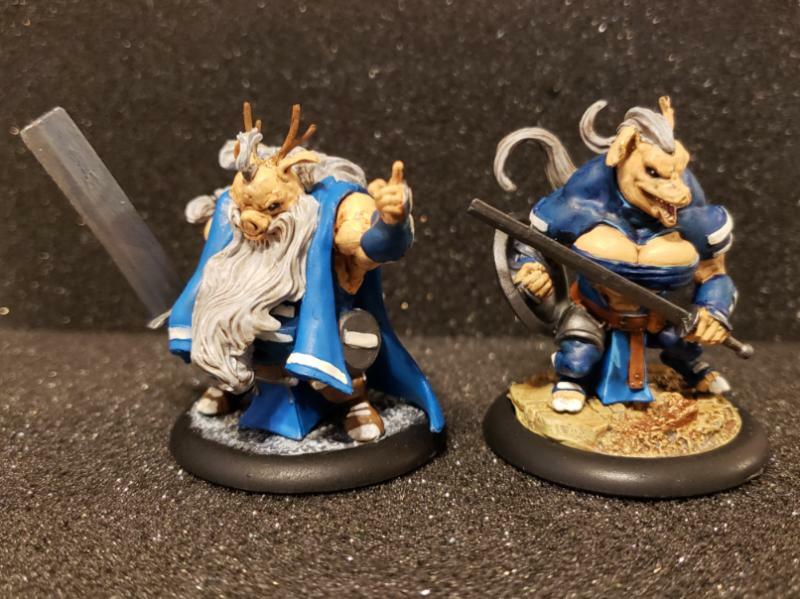 1/18 Surviving the Apocalypse with Pigs and Samurai!?! I’m interested in what you pop up on YouTube, if you have links please post them as I have been watching more. 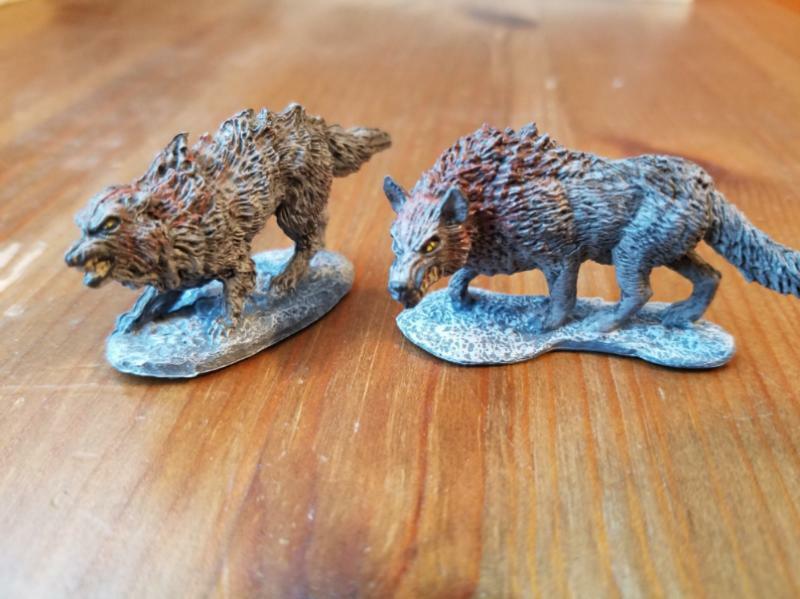 I like the wizkids deep cuts terrain pieces and animals, though the grizzly seems small to me. They serve their purpose of being cheap and “good enough” yet still better in my eyes than the bones models. Have you checked out Warbanner.com? Looks like the driving force guys behind Test of Honour have taken the game from Warlordgames and struck out on their own with a second edition coming out. They have the models from footsore games and a good sculptor (looks like the guy who did all the metals for Warlordgames Test of Honour. Reasonably priced and they are not changing the rules too much, more just streamlining them. The youtube link is in my signature down there. I agree the bear seems a bit small, but after comparing it to a Bones one, it's not that significant of difference. I think there's another one coming in Bones 4, so hopefully that'll be more impressive. I saw your post about Warbanner and them taking over Test of Honour. That's good news. Game system is cool. I'll have to take a look at the models. 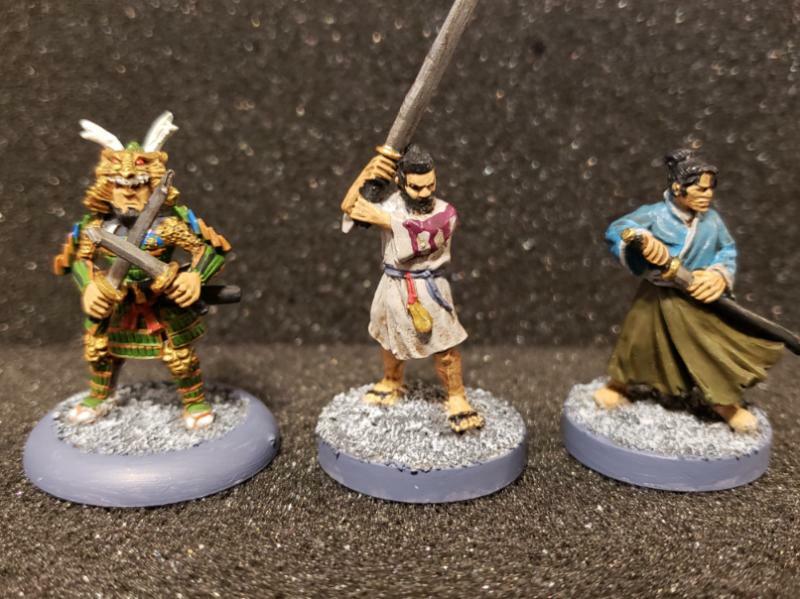 My spidey- sense keeps telling me someone is missing out on having a real good plastic samurai kit, as I feel like as a genre the Sengoku era stuff is going to be this year's Cthulhu/ Zombies/ new hotness. 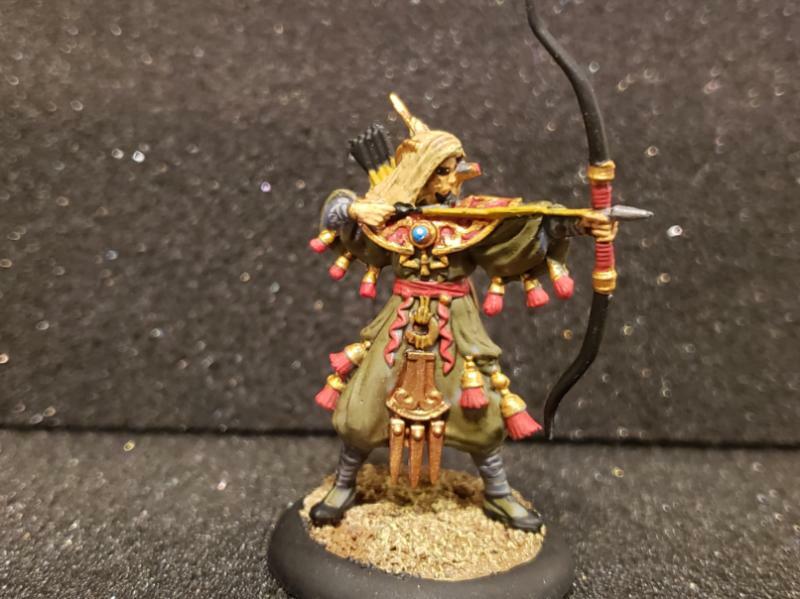 I've been trying to build through my Warlord/ WGF samurai backlog and with every figure I build, I distinctly recall how much I'm not a fan of their hands and weapons. Subject: Highlording it up with Highlord Tamburlaine. 1/18 Surviving the Apocalypse with Pigs and Samurai!?! I'm curious how you're going to convert them too! My photos keep coming out too bright. Ugh. 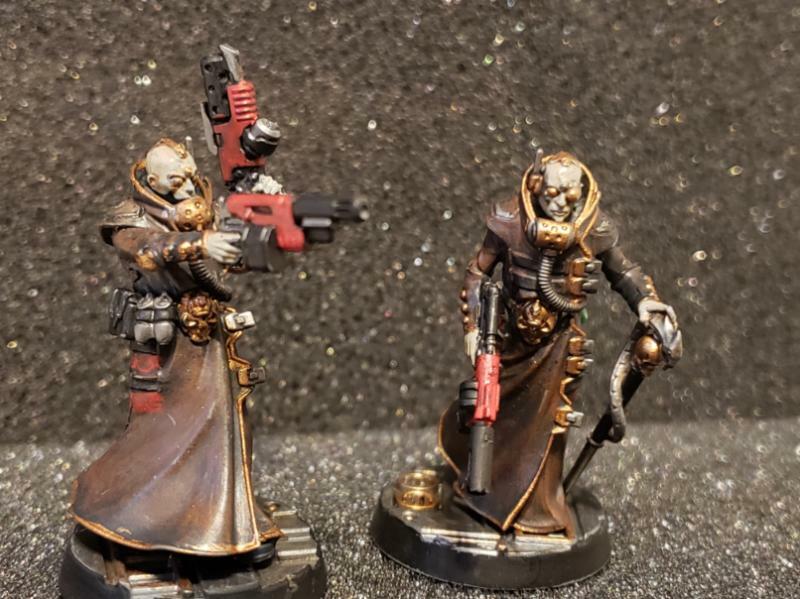 Started in on my Delaque box. Got a few done. I feel like they need a bit more work- just not sure what or where! At least they look like they're acceptable for a tabletop game. Hopefully I can finish off the box and we can consider actually playing a game of Necromunda. Trying to get a few more Deep Cuts animals done for this weekend. Hopefully we can squeeze in a game of Paleo Diet. Also finally snatched up a Kenshiro figure for Eden, because he's only the most appropriate figure for a post apocalyptic game. I'm going to try and get him primed and started this weekend. Currently trying to build my way through a rather big pile of Test of Honour stuff. Hope to be able to show those soon! Subject: Highlording it up with Highlord Tamburlaine. 1/25 Sneaky Delaque sneaking onto my table! 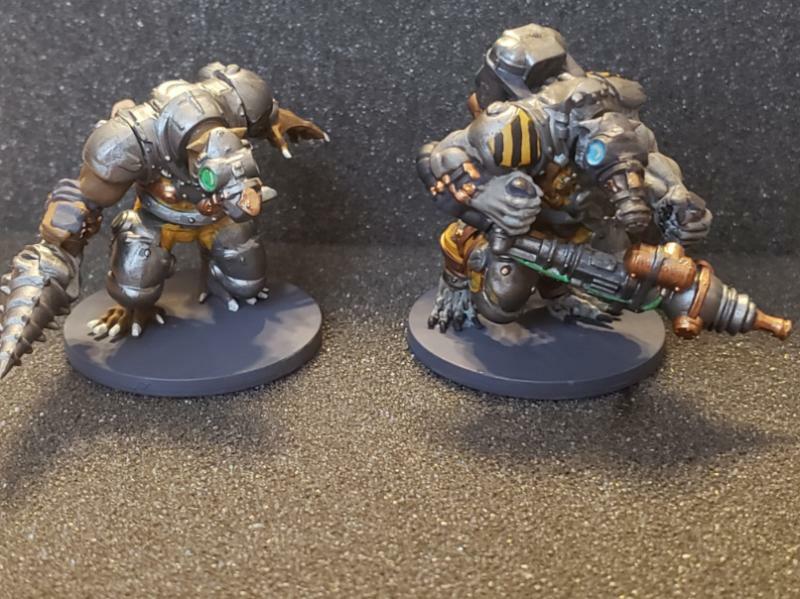 Are those the bases that come with the minis? 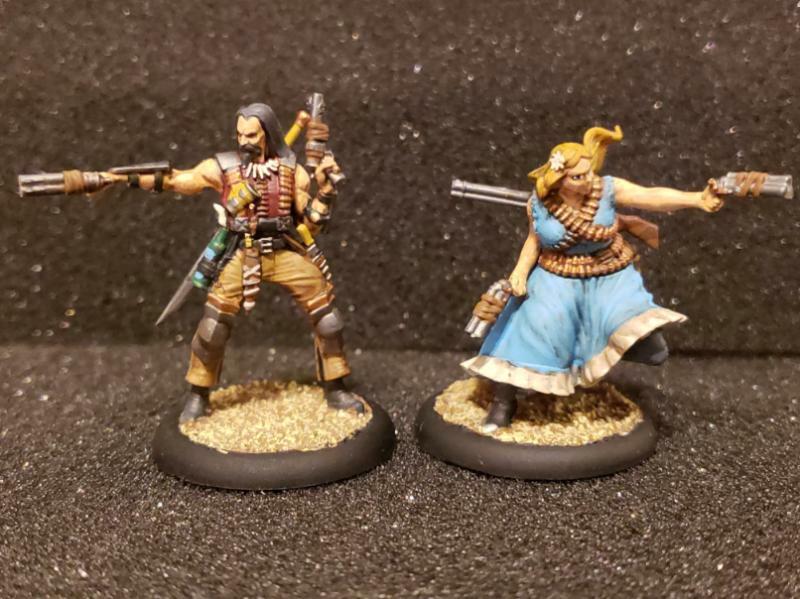 Wait, you actually painted some Necromunda figures? Crap, now I need to go paint some more of mine. Subject: Re:Highlording it up with Highlord Tamburlaine. 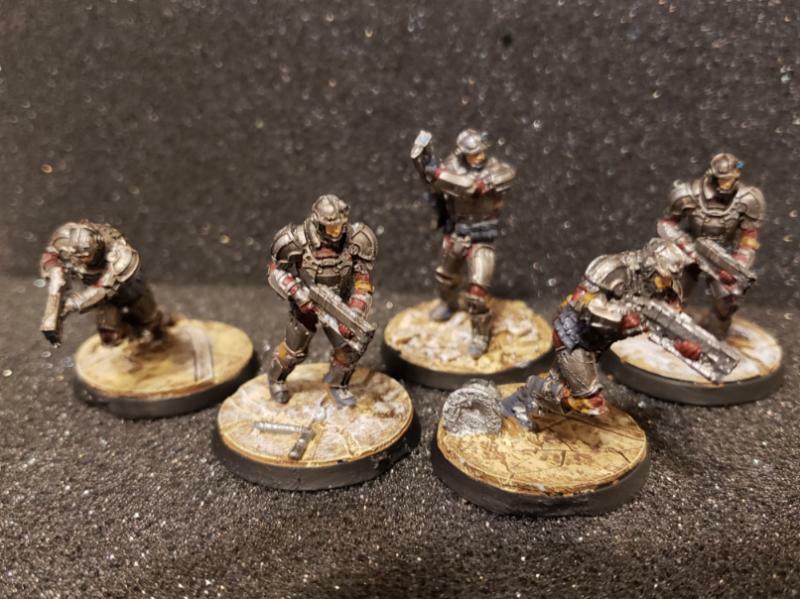 1/25 Sneaky Delaque sneaking onto my table! 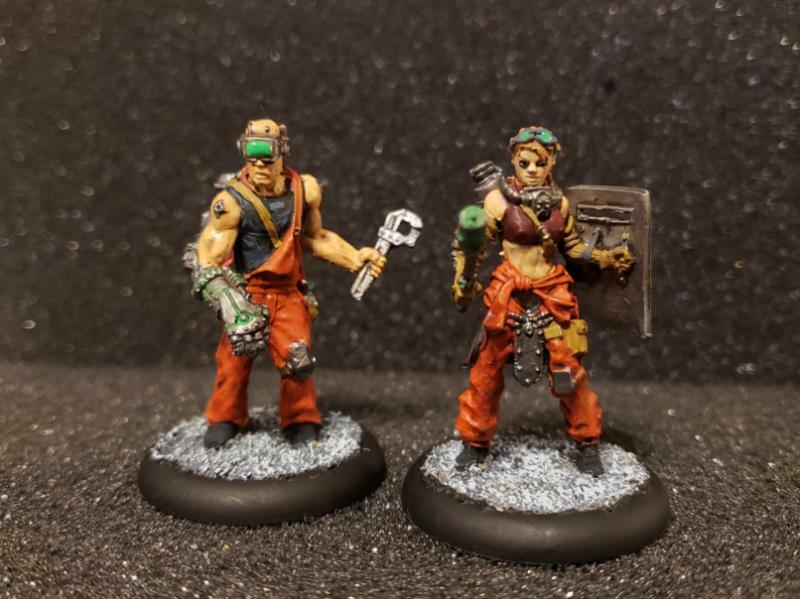 Yeah, those are the basic Necromunda bases. All the gangs so far have them. Not sure how many designs there are, but I know those four all have unique ones.